Writing is an art. It is very important and will help you in every walk of life. Good writing skills will not only help you in school/college but this creative tool will help you in professional life as well. Writing is an art. It is very important and will help you in every walk of life. Good writing skills will not only help you in school/college but this creative tool will help you in professional life as well. In offices, a person has to write proposals, drafts and whatnot. One just cannot write an impressive proposal without having good writing skills. So, if once you learn how to write concrete sentences, they will help you for the rest of your life. And you can pass on this talent onto the next generation as well. Teachers and parents play very important role in this. They have to make a strong base to create a strong building. If they start learning how to write from the beginning it will not be a hard task in the future. It’s not only teacher’s job to teach the students good writing skills, its parent’s duty as well. Parents should give their children different books to read, teach them how to use a dictionary. This will build a habit of reading and improve vocabulary as well as they will learn how to form a sentence structure. As Stephen King said and I quote “if you don’t have time to read, you don’t have the time (or the tools) to write. Simple as that.”These steps are really important in personality development. Start from the basic e.g give them small spellings to memorize because dictation is a very good process to make them memorize spellings and it serves as the first step. These small steps will help them in future. Parents should know what sort of mindset their kids to have, give them a random topic and tell them to write whatever they want to. Tell them to write short stories and let them be creative. This will make them hard working, expressive. Teachers play the most important role in student’s life. They work as a guiding light that will always light their ways. Writing is so important and teacher should take this as their own responsibility. As I said earlier that writing is something that will always help you. Make your classroom environment as friendly as possible. Discuss new ideas and possibilities, tell them the importance of writing and teach them the rights and the wrongs of the writings. Teacher’s guidance will pave the student’s way towards success. Give your students the time to discuss and share their opinions. Teachers should listen and admire their thoughts and ideas it will boost their confidence. 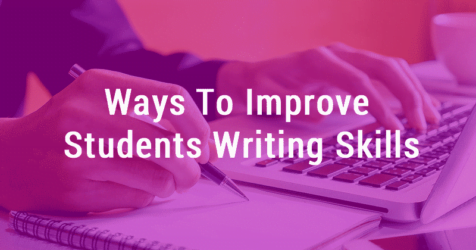 Give them writing exercises for class work and homework as well. Keep them engaged, tell them how to solve a certain questionnaire, research paper. Teach them how to write an essay and an assignment also briefs them about the importance of thesis statement. Explain to them that writing is not that easy, you have to know all the technicalities of the writing. And how wrong writing pattern can penalize their work and affect their grades. Share your experiences that how you learn all the writing skills and how you overcome your flaws. Students idealize their teachers so sharing an experience can motivate them. Conduct seminars on writings at your school. The most important part is that aware your students about plagiarism and guides them about plagiarism software. Tell them that its stealing and ethically wrong. Also, teach them the importance of grammar and sentence structure and the content. Students should know how to research the topics recommend them books, journals and autobiographies etc. tell them to note down the important points from the lecture. The more knowledge they have the easier it is for them to write. Students learn 70% from writing and 30% from listening. 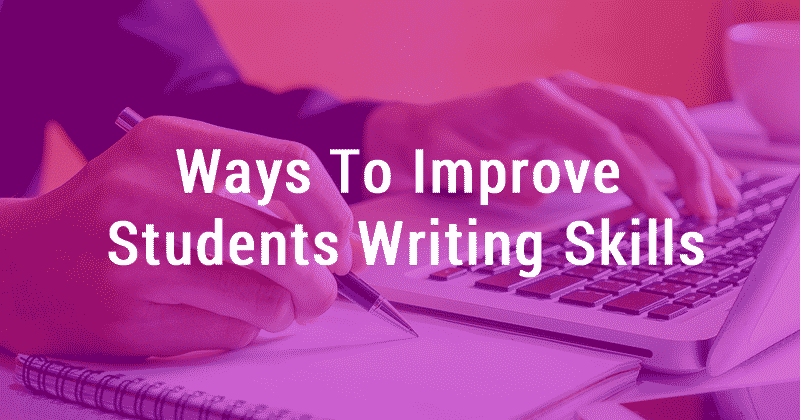 The article “Ways to Improve Students Writing Skills” is written and brought to you by Hussain Ali. How to Get College Scholarships and Grants to Support Educational Expenses?